Videos are our window on the modern world. It’s not like the olden days when we just had a lifeless snapshot, and perhaps an observer’s biased opinion to give it meaning. Oh, no. The Internet has spoken, loud and clear. Videos allow average, everyday people to share bits of their lives with previously unheard of audiences—for instance, just think about some silly, shaky iPhone recording you saw that garnered millions of views. Reflect on the power that something like “Charlie Bit My Finger” can have on global culture. Seriously, it’s a crazy phenomenon. However, videos can be far more than just entertainment. They can be excellent, authentic Spanish learning tools that let you peer into someone else’s life, language, culture and society for a moment, just enough to get a good glimpse. Watch enough Spanish videos, and you’ll gain an incredibly broad perspective of the Spanish-speaking world and the diversity that it encompasses. Here, we’re going to explore the best Spanish-language videos and resources for Spanish-language videos, starting with the basics (made for language learning to dip their toes in the water) and then getting progressively more fun. We’ll start with videos that take your learning down a more traditional route. Sometimes, you’ll feel like you’re in a classroom. Other times you’ll feel like you’ve got a personal tutor. Still other times, the experience is more like watching an informative PBS show or listening to a tipsy friend lay out Spanish pick-up lines over too many beers. Try out all these different video styles and see what works best for you! Variety is the spice of Spanish learning. Here are a few options to get you started. Do you know how to talk about the world’s most famous superhero team, the Avengers, in Spanish? You might be surprised at just how often you’ll want to be able to drop superhero names in conversation. Want to bust your uber-patriotic friend’s chops by calling him Captain America? Want to talk to little kids and teenagers about their favorite pop culture icons? Want to comment on someone’s 6-foot-tall and extremely cool Iron Man Año Viejo (an effigy of a popular character or famous person burned ceremonially on New Year’s Eve in Latin America)? Alright, then! This highly entertaining video clip will teach you all the Spanish you need to know about superheros, cinema, Hollywood magic, script writing and behind-the-scenes film production. Oh, and there’s plenty more pop culture fun where this came from on FluentU. You’ll find hundreds of videos there relating to movies, music, celebrities, television and more entertainment topics (among others). 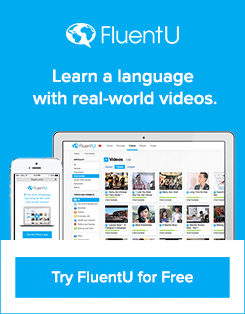 This is an example of the more instructional videos on FluentU. These are packed together in thematic “playlists” which provide neatly organized courses for Newbie and Beginner Spanish levels. This particular video is part of a 3-video series on Spanish possessives. Not ready for possessives yet? Then start with the “Basic Verbs” playlist. Too advanced for possessives? Then try the “Common Stem Changing Verbs” or “The Future with ‘Ir'” playlists. 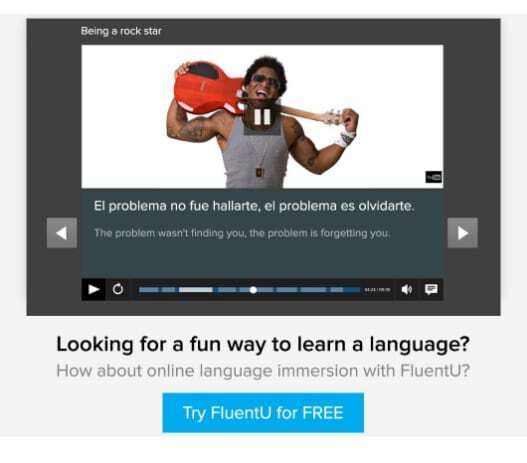 While most of the videos on FluentU are from authentic sources—such as blockbuster movies, music videos, news broadcasts, street interviews, cartoons and more—these playlists offer structure and guidance for Spanish learners who are still getting off the ground. Ready to inject your Spanish with a little humor? This video is only one of sixty-eight. Yes, sixty-eight. You could learn one joke a day for more than two months, and you could just keep cycling through them until you learn them all. Just think of all the new vocabulary, idioms, figurative language and puns you’d learn! Plus, you’ll be able to share a joke anytime you need to break the ice. Simply put, Señor Jordan is the man. He makes Spanish learning fun with all the awkward quirk of a professional educator who loves his job a little too much. When he’s not teaching his own Spanish classes, he takes his free time and turns it into Spanish video production time. Check out his frequently updated website and YouTube channel for tips, tricks, humor, educational songs, interactive stories, quick grammar how-to’s, full-on lessons and more. Phone conversation skills in Spanish are critical to learn. You’re going to need to communicate with hotels and hostels, travel agencies, restaurants, taxi cab services, friends, family and more people than you ever realize before traveling in the Spanish-speaking world. I have to say, this is probably the point I struggled with most even after reaching a level close to fluency and living in Ecuador for a solid year—and even after needing to speak to professional contacts on the phone from my NGO office for that entire year. Interns, volunteers and new English-speaking staff all seemed to have the same problem, too. I’m willing to bet you need a hand. This video, like all the others on this channel, is sweet, simple and straight to the point. You get the information you need, neatly written out on the instructor’s whiteboard, and she’ll walk you through in-context usage of new vocabulary as well as pronunciation. It’s just like having a private tutor! Check out all the other videos on this cheerful yet practical instructor’s channel. She covers everything from flirting to traveling and advanced grammar patterns. While some of the above videos are indeed on YouTube, we’re moving on to a new category here. YouTubers and vloggers talk more about daily life, chance occurrences, trends, frustrations, minutiae and exciting news and popular topics! So, basically everything under the sun (and beyond the sun, I suppose) is a possible topic for these guys—but the topics are discussed in a friendly, casual style with a personal touch. This video is a double-whammy. We’ve got a Spanish-speaking vlogger speaking about awesome Spanish-speaking vloggers. The positive vibes are flowing here, as one of the best Spanish-speaking vloggers describes what he admires about his peers. Two possible directions to go from here: (1) Explore the rest of this loud, outspoken, extremely animated guy’s vlogs (covering everything from arachnophobia to globetrotting) and (2) follow his recommendations to a bunch of other fun vlogger channels en español. I’m chortling to myself. 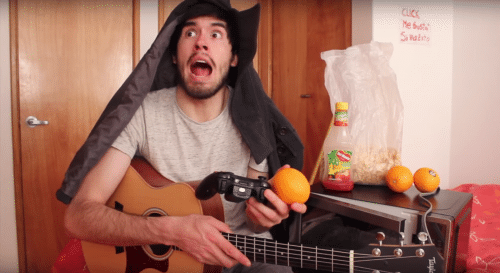 This Chilean YouTuber takes “goofball” to another level. Are you a sibling? Do you have cousins or friends of various ages that lived in your house like siblings? Well, the hyperactive, one-man discussion in this video will be too familiar. Here, our wild, unpredictable host deftly imitates any household’s youngest, middle and older siblings’ behaviors, interactions with one another and relationships with mom. The whining, the bickering, the power plays and the grabs for attention are all too real—but in the end you can see how everyone weirdly loves each other in their own familial ways. I say “weirdly,” because every character is played by Germán in thrown-together costumes made from household items. This is his most viewed video for a reason, and it’s a great sample to get a taste of his channel’s content. This redheaded vlogger speaks a mile a minute, but he’s as entertaining as the past two vloggers in his own right. I don’t how on earth he’s able to turn on a camera (always one with a fish-eye lens or some kind of funky perspective trick that perhaps a videographer could correctly identify) and just talk entertain with his thoughts and stories, but, man, he can do it. This particular video tells the story of how our host vlogger once thought he was going to die during a trip. I won’t tell you any more—if you find that kind of harrowing, personal adventure tale intriguing, then go watch! Sun, sand, surf. Does it get any better? This well-known, vlogging Spaniard, Luzu, goes on a journey along the entire coast of California, surfing every possible spot along the way and recording every luscious moment as he lives the dream. This video is the beginning of a 5-part series which will make you feel like you’re part of the chillest road trip imaginable. This vlog is my personal favorite—one I subscribe to and watch whenever I can. I have a hunch you’ll fall for the lush indie music, gorgeous cinematography and stories of Americana as told by a speaker of Castilian Spanish. Keep exploring the channel at large and you’ll find vlogs that come back to one central topic: What it’s like to be a Spaniard living it up in California. You’ve got videos of a Route 66 road trip, urban exploration in Hollywood, people savoring sushi and, of course, tons of surfing. If you love Disney, or you just love singing along to lovely songs while learning Spanish, stop right here. This video is great because it combines the “Colors of the Wind” song and animated scene with the vlogger singing. Explore this vlogger’s channel a bit further and you’ll uncover dozens more Spanish-language Disney covers, plus personal vlogs about the life of the singer herself. The following videos are all still YouTube-based, but we’ve got yet another category so that food lovers can track down what they know best. Want a taste of Hispanic cooking? You got it. Whether you’re an ambitious chef seeking recipes or you’re just curious about the preparation of various traditional and modern foods from the Spanish-speaking world, these videos are great for learning kitchen, food and restaurant vocabulary. Not to mention, cooking show hosts (even those on YouTube) like to speak extra slowly and clearly so their viewers can follow along step-by-step—and so that there’s ample time for them to actually cook the food. These unassuming, no-frills potato tortillas are everywhere in the Spanish-speaking world, and they make for a strangely addictive snack. If you’ve had them before, I imagine you’ve already clicked the link to see what the recipe says. Yeah, they’re pretty delicious. There are many more traditional Spanish and Latin American dishes on this page, but there are also tons of diverse plates from around the world—oftentimes with a somewhat Spanish spin. The presentation of recipes is perfect for learners looking for a good pair of training wheels. The ingredients are clearly shown at the beginning, and written out on the screen in large, easy-to-read text. You’ll see the quantities, measurements and serving sizes right upfront. The visuals really help to guide you along the way as the cooking commences. You might also want to try out another channel run by the same people—one that’s totally devoted to baking pastries and desserts. Whip up the Tarta Tres Leches (Three Milks Cake) for starters! Hilda does vlogs, makeup tutorials and more—but she also makes some exquisite-looking homemade Dominican food. If you haven’t tasted Dominican food yet, please go do so now. I’ll wait. Pollo guisado is a deliciously saucy stew made with chicken, vegetables, and spices. You’re welcome. If you enjoy this, you may also want to try cooking Hilda’s habichuelas guisadas dominicanas, which also come highly recommended by my taste buds. This giggle-inducing sketch comedy group from Ecuador, EnchufeTV, blesses us with a new video every week. The quality never falters. Every single one seems to be able to strike your funny bone in just the right way to get laughs. This video will give you a quick introduction to the program and what to expect. Definitely go spelunking in the deep depths of this channel, and I guarantee at least a mild addiction—but addictive is a great thing when we’re talking about Spanish study materials. Even lower-level Spanish students will be able to follow the wild facial expressions, strong visual cues and all-too-familiar scenarios that befall us in daily life, work, relationships and more. Wilmer Valderrama is more than Fez (from “That 70s Show”) and Demi Lovato’s Instagram-savvy boyfriend. He’s apparently a pretty decent comedian, and has made some appearances on Spanish-language sketch comedy shows. Here’s an example of one, where he plays the frontman of a situationally-inappropriate mariachi band. Check out the rest of El Vacilon for more goofball comedy from Spain (but be careful, some of the content is quite mature!). I can’t recommend you a show or clip to watch here, because this website’s content is rather time-sensitive! This is where you can go to find streaming sites for any and all Spanish-language soccer matches. This will sometimes send you to paid streaming websites, but they’re all high quality and worth considering buying a pass to if you’re really into your fútbol. If you’re going to pay for a soccer match streaming service, try here first to see if your favorite leagues are available. This is the most convenient service for regular, die-hard viewers, because you can stream high-definition video directly to your TV with the help of Amazon fireTV, Roku or Chromecast. You can also stream directly to your computer, tablet, Android smartphone or iPhone. There’s a good reason why I already recommended BuzzFeed Español as the #1 easiest way to learn Spanish: The content on the site is the perfect blend of funny, topical and informative. There are cultural tidbits, recipes, how-to guides and even videos that explore the diversity of the Spanish-speaking world’s regional languages (or dialects) and cultures (but please don’t click this link unless you’re prepared for some mature, R-rated content). I’ve just got to recommend Netflix if you’re looking for Spanish videos, I would be remiss not to. If you’re already on Netflix (which you totally should be), then you may already know exactly how to learn Spanish using its fabulous services. You should also be aware of the great Spanish-language content they frequently have to offer. They’ve got tons of telenovelas, movies and mini-series that were originally created in the Spanish language, not just translations of popular English-language content. My current obsession is “Pablo Escobar, el patrón del mal.” Transport yourself to another place and time—the producers of this show really must have spared no expense, because every last detail is impeccable. From the flawlessly natural acting to the powerful script and sublime cinematography, this show’s got everything perfect. Every twist and turn of this show, every alleyway in Bogotá, feels authentic. That’s because it’s made by Colombians for Colombians (and the rest of the world, of course). This is as close as you’ll ever get to knowing El Patrón and his gang on an intimate, personal basis. However, if you’re looking for Spanish dubs and subs, this is the place for that as well. This is your one-stop shop for telenovelas, dibujos animados (cartoons) and almost the complete lineup of popular Univisión programming, including Metástasis (the Colombia remake of “Breaking Bad”), major beauty pageants and more. Cartman, Kenny and all the rest en español. As a “South Park” fan myself, I resisted watching the Spanish-language version for a long time, because I assumed it couldn’t possibly capture the spirit of the show. But, oh, it really does. Very little is altered from the original show, and the voices are not a far cry from the English ones. What jokes have been adapted to land with Spanish-speaking audiences are as funny (and at times funnier) than the original jokes. I kid you not. Now that you’ve got all this awesome Spanish-language video content lined up, you have no reason to begrudge yourself some vegging-out time. Open your laptop or turn on your T.V.—you’re overdue for some quality chill time. Indulge in some guilt-free leisure time for once. After all, this might just be the most effective way you could study Spanish!